This is my last map/plan for a while. 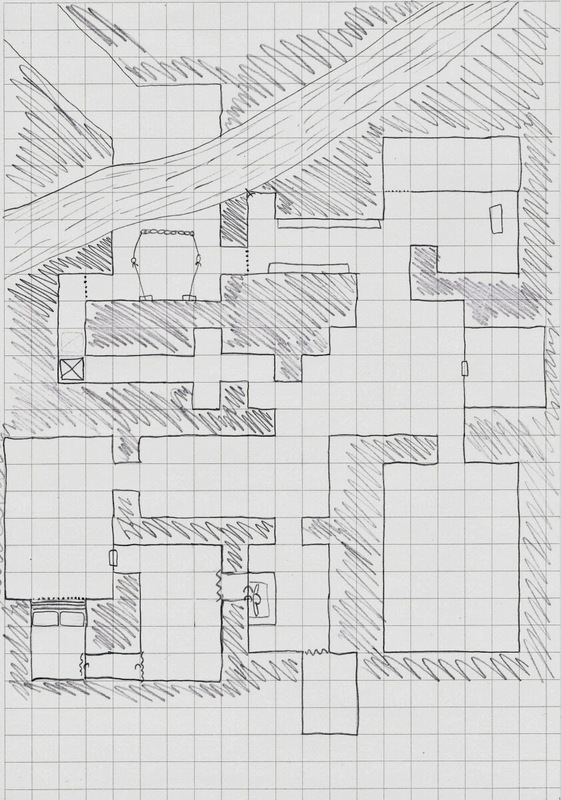 However, I'll putting all my recent maps up on RPGNow.com as a free/PWYW PDF. I'll then do an email shot to my previous RPGNow customers to announce it and give my Kickstarter a final push for the last week. Thank you to everyone that has commented on and/or +1'd my maps. I'm sure I'll be back with more to support my next project. This is a plan of Bodiam Castle in East Sussex. Marg drew it for me using a couple of existing plans I found on the web for reference. Having a drawing of it is handy, as it can be scanned at a high resolution and printed out (on several sheets of paper) at a scale for using with miniatures. 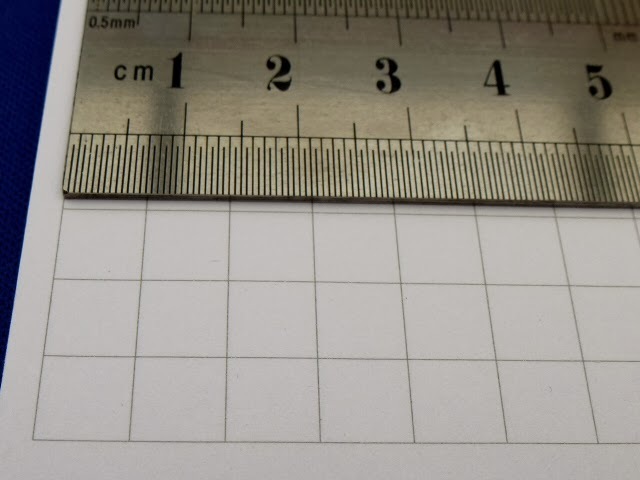 It is drawn on an A5 sheet of paper with a 7mm grid. Pads of the very same paper, along with larger A4 ones are available via my Kickstarter project. 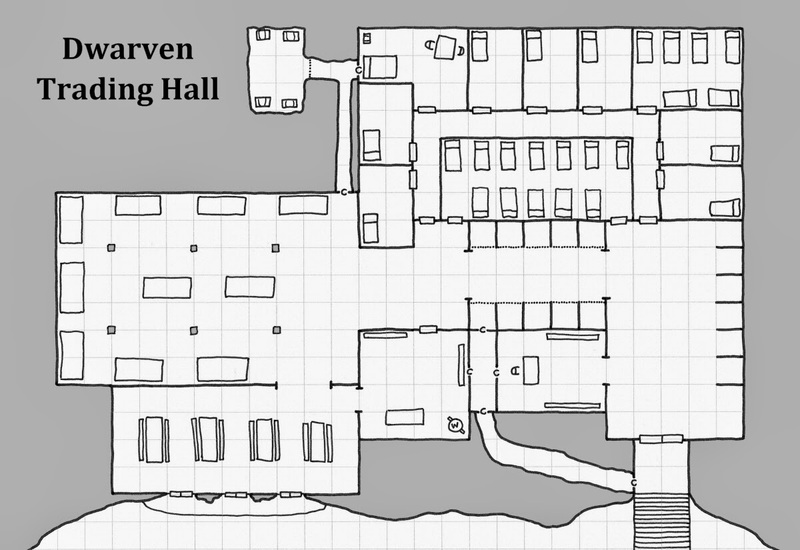 This map is a plan for a Dwarven Trading Hall or Rest Stop. I imagine it to be set in the mountains, midway between Dwarven Holds. It would be a place for the little fellas to break their journeys, and/or trade with one another. I'm not sure strangers would be welcome. It is drawn on an A5 sheet of paper with a 7mm grid. Pads of the very same paper, along with larger A4 ones are available via my Kictstarter project. This map is a based on an illustration from a children's history book. It's a map of an 11th century Scottish village, but I think it also has the right feel for a fantasy village on the edge of civilization. Marg drew this one for me (in case you were wondering why it looks better than my other maps). 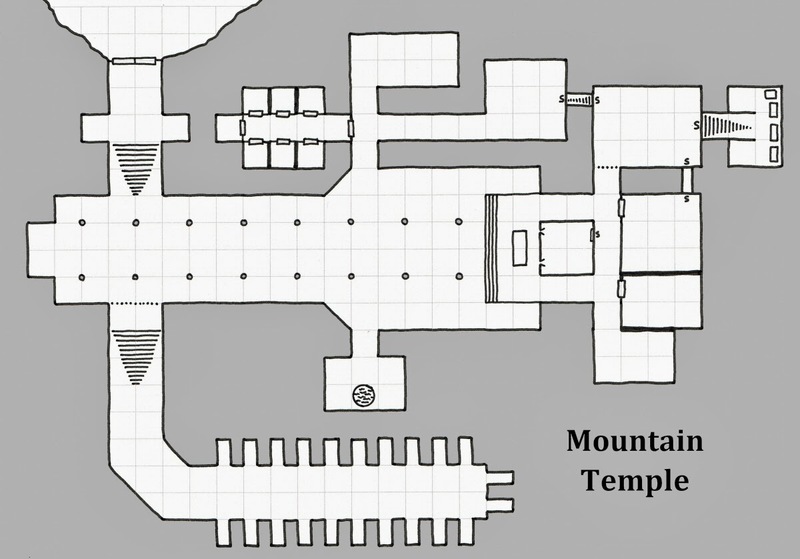 Here is another new map that I've drawn to support my Dungeon Mapping Pads Kickstarter. This one is drawn on a sheet of A5 paper with a 3.5mm grid. 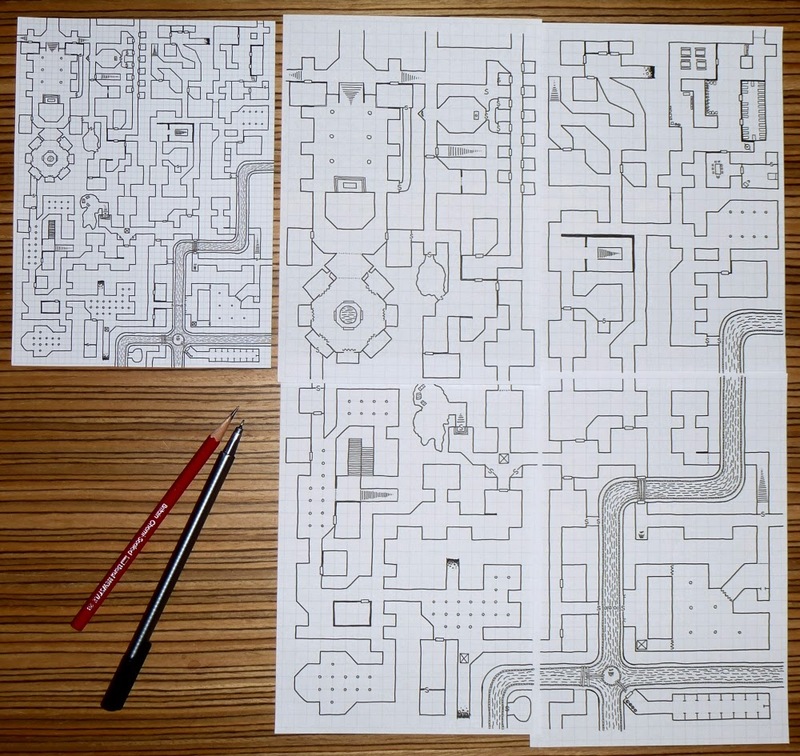 It's part of a Megadungeon level designed to illustrate the usefulness of have paper with differing grid sizes. I've also drawn the map split into quadrants, on 4 A5 sheets with a 7mm grid. All the maps are completely hand-drawn with a pencil and a couple of black fineliners. The second image shows a scan of the first image. I corrected a couple of small mistakes, applied the cartoon filter in GIMP and used a grey fill for solid areas. 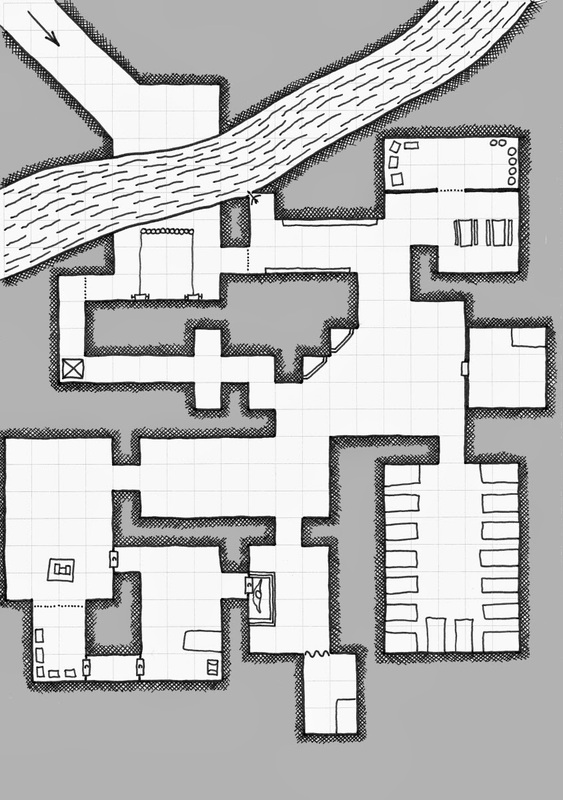 Here is another new map that I've drawn to support my Dungeon Mapping Pads Kickstarter. This one is drawn on a sheet of A5 paper with a 7mm grid. It's a map of a Mountain Temple cut into the mountain. A centuries old forgotten place recently rediscovered by cultists. 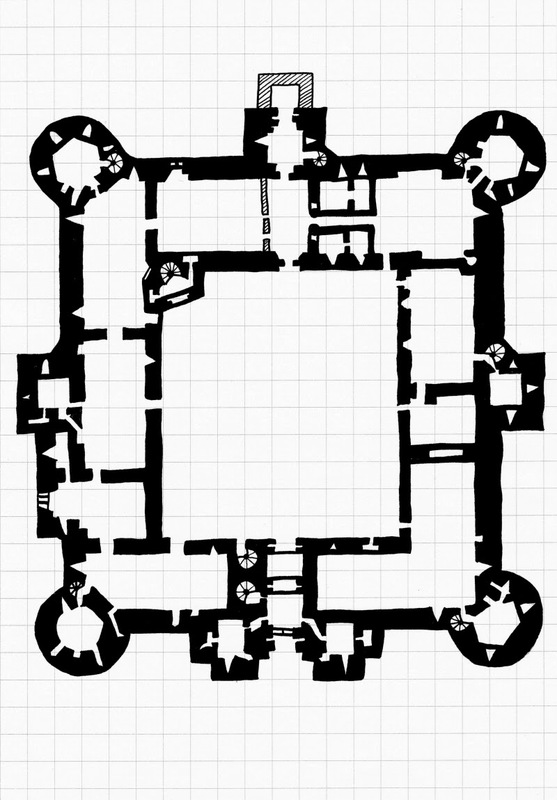 It would be very easy to extend it to serve as an entry point to a large dungeon with the addition of some stairs or maybe a doorway that has been bricked over. The map was completely hand-drawn with a couple of black fineliners. I then scanned it, applied the cartoon filter in GIMP, used a grey fill for solid areas, and added a title. 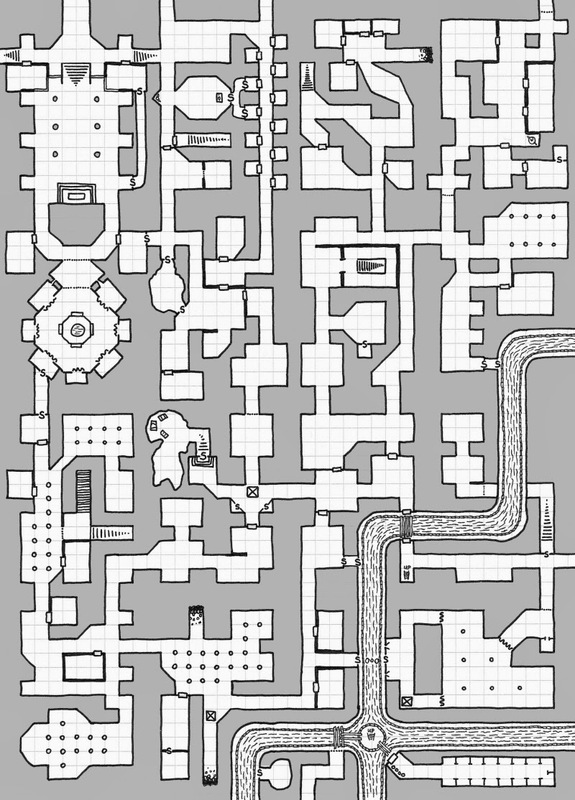 Here is another new map that I've drawn to support my Dungeon Mapping Pads Kickstarter. This one is drawn on a sheet of A5 paper with a 7mm grid. It's a map of The Dead Road which I see as a location inside a necropolis. It'd be a place where very important and/or dangerous people are laid to rest. The road gets extended, and new crypts get added as required. 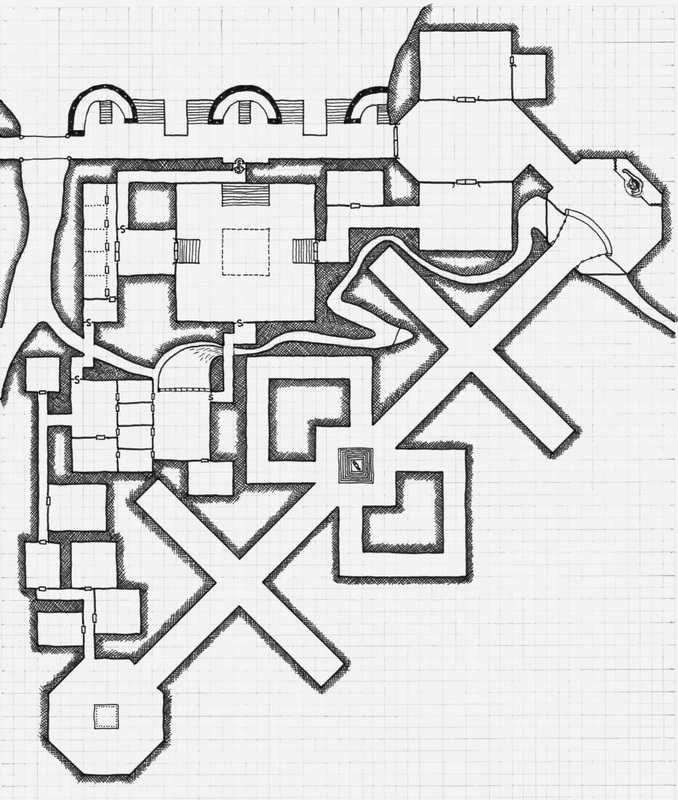 This may appear in an adventure at a later date, but for now it's just a map. 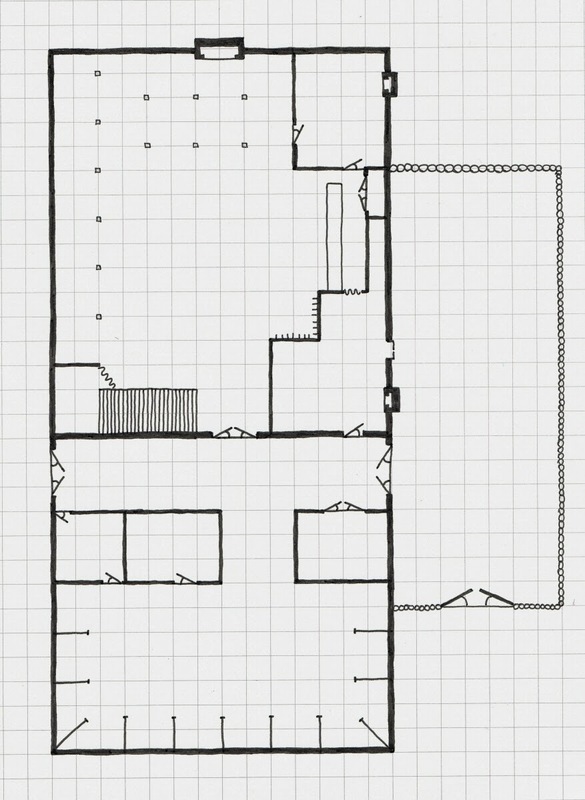 Today I've drawn a floor plan of an Inn. I used 2 sheets of A4 7mm grid paper and a large scale of three feet per square. The larger scale also makes the plan ideal for printing out as an enlarged version on several sheets of paper to use with miniatures. I've stuck mainly to structural features on the plan. 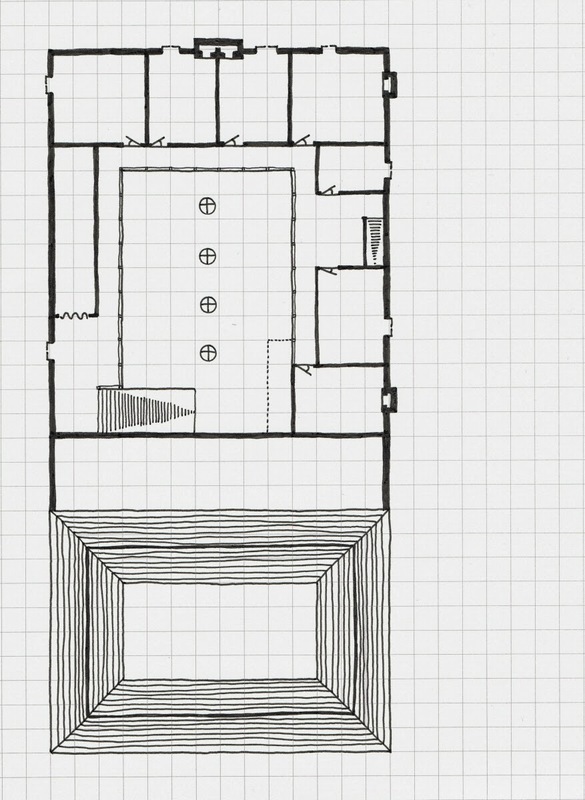 I'd probably add tables, chairs and beds using the computer, rather than drawing them all by hand as they can easily be moved around. The paper used is a sample from the pads I'm currently funding on Kickstarter. The project is just a few pounds away from hitting its first stretch goal to upgrade the paper weight and print a smaller grid on the backs of the sheets. 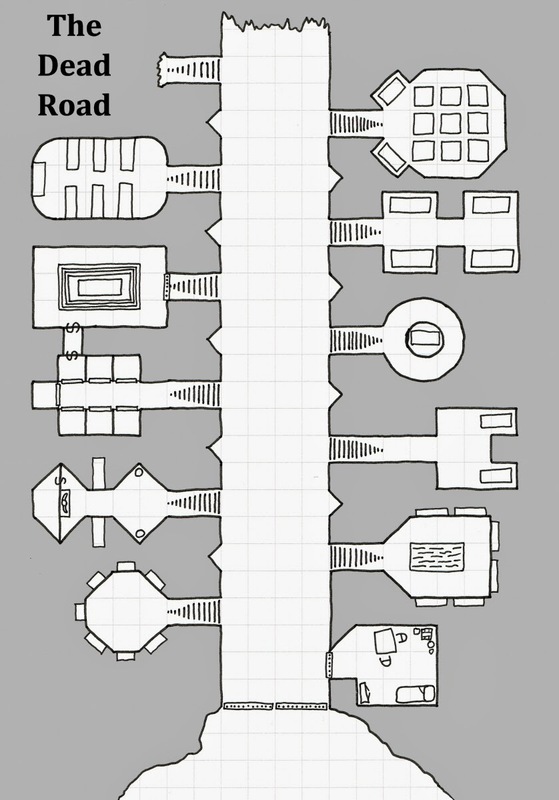 To promote my Dungeon Mapping Pads Kickstarter I'm going to post a new map every couple of days to show what is possible with the different size/scale pads I will be printing. I drew a quick pencil version of this map this afternoon while my daughter was playing in the park. I then redrew it this evening in ink and scanned it. The only computer work done was to add the grey fill areas. 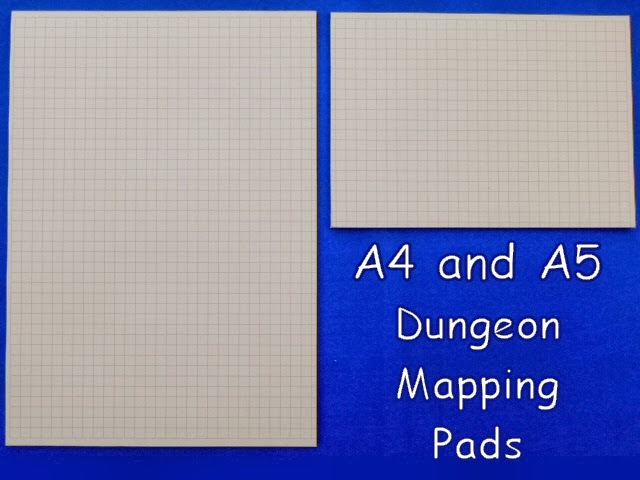 The pad used for these maps is from an A5 pad (I cut down one of my A3 pads to make a sample A4 and A5 pad)with a 7mm grid. It's a really nice size to work with. 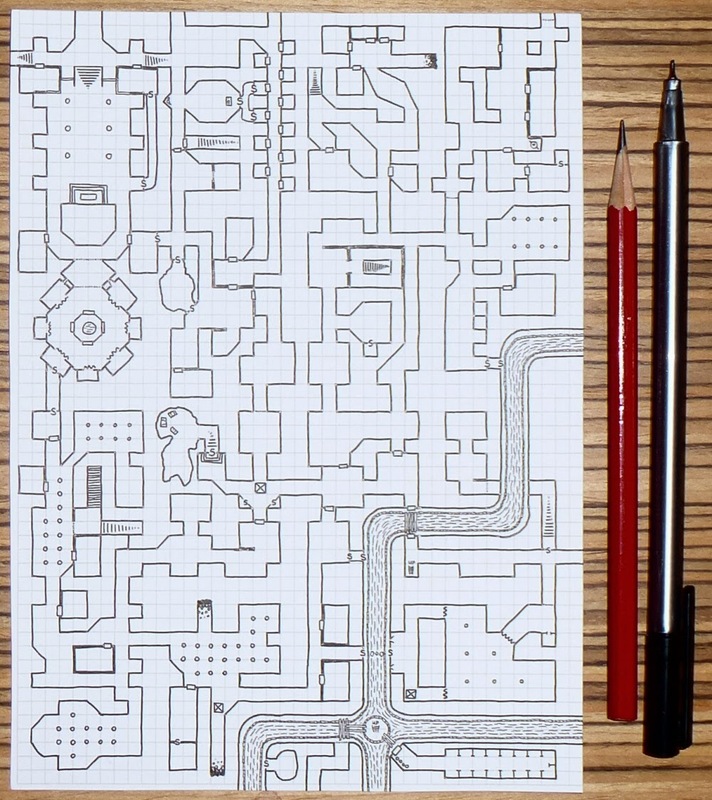 I've just launched the Dungeon Mapping Pad Kickstarter. 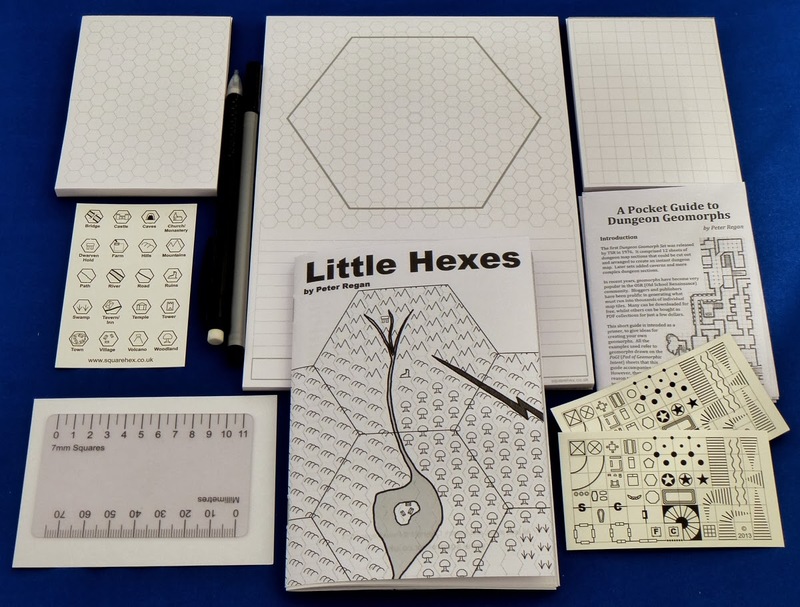 This is my 7th Kickstarter and will add A4 and A5 grid pads to the Squarehex range. 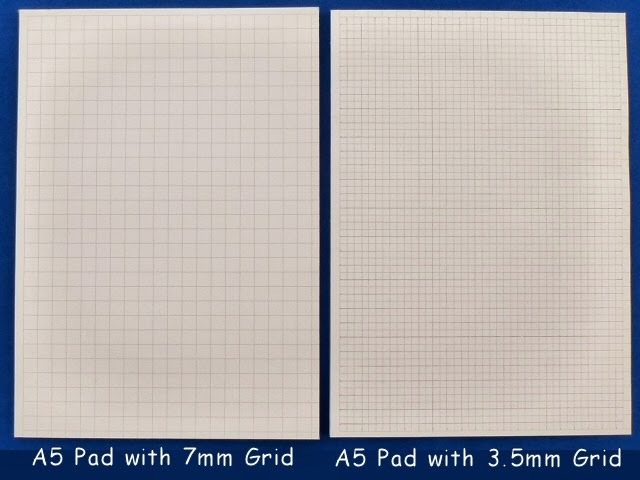 The pads will have the same 7mm light grey grid as my Pad of Geomorphic Intent (PoGI) and A3 pads. The first stretch goal for the campaign will upgrade the pads to heavier 100gsm paper and double-sided printing. 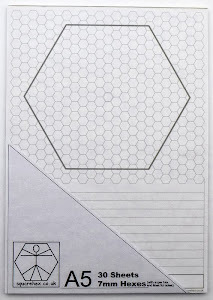 The reverse sides of the sheets will have a 3.5mm grid. This will make them a truly universal aid for creating all sorts of gaming maps. I've put together a sample pack of pads and accessories from the Squarehex range. It can be bought from the Squarehex site, or by using the Paypal button below. The pack also offers a saving of over 20% compared to buying the items individually. The pack weighs just under 250grams to keep international postage as low as possible. 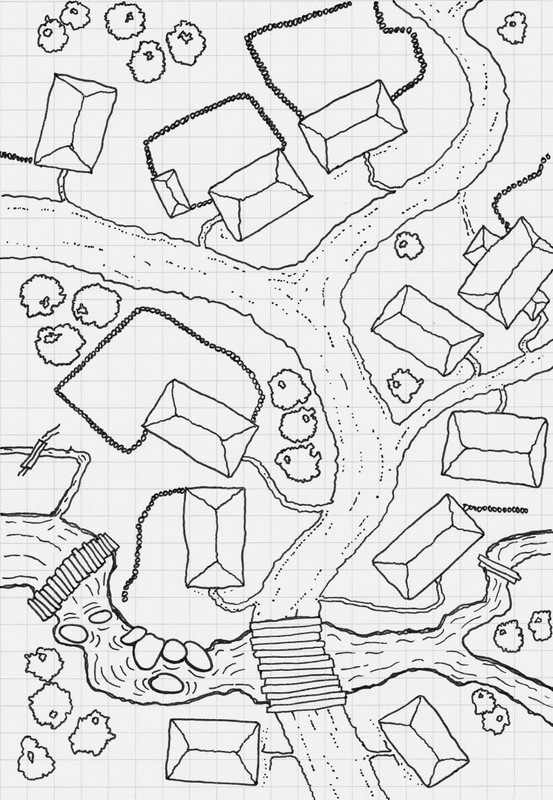 As usual with these campaigns I like to draw some maps to go with them. 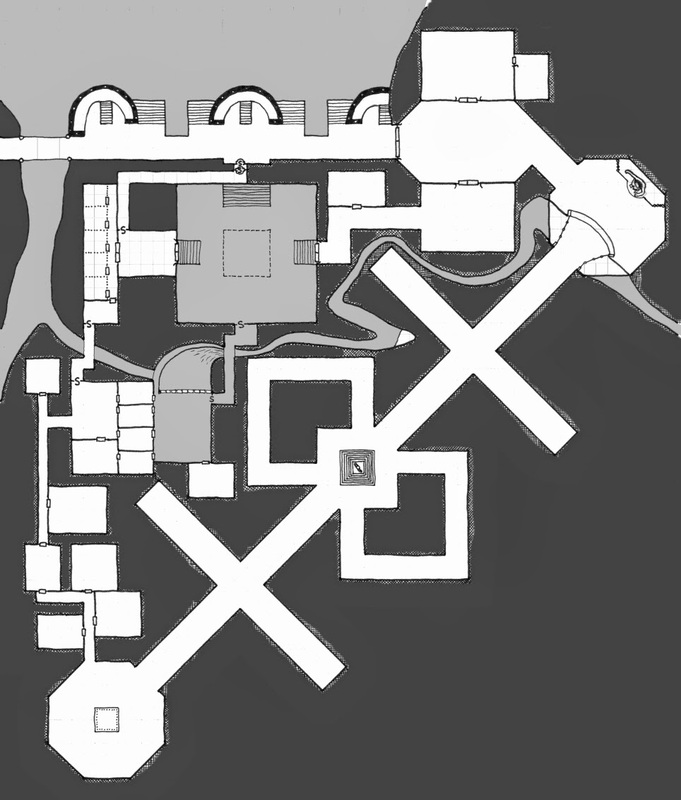 The first one that I'm working on is a map of Albie Fiore's classic adventure The Lichway. I bought a copy of Best of White Dwarf Scenarios I last year for the sole purpose of getting a nice print copy of this adventure. However, such was the popularity of the dungeon that the magazine arrived with The Lichway pages carefully cut out - it clearly now resides in some ageing DM's folder somewhere. Not to be outdone I decided that I would make my own Lichway map. Below is my hand-drawn map which is drawn on an A4 sheet of 3.5mm grid paper (I cut down an A3 pad and added extra lines by hand to the existing 7mm grid). 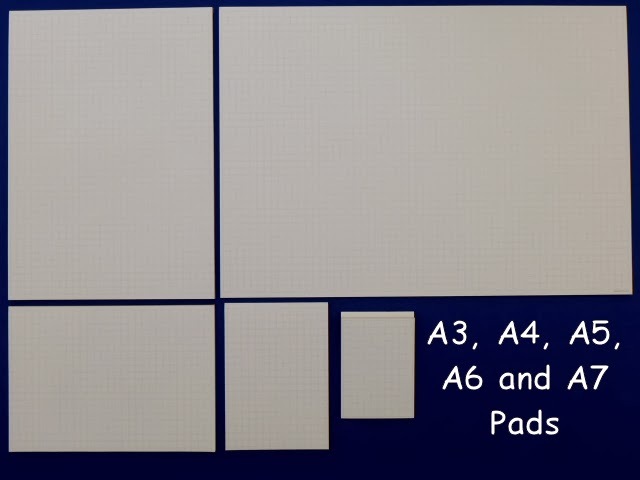 This gives a pretty good idea of what the reverse side of the new pads will be good for. The second image is a work in progress look at the map. It still needs lots of work on the computer but it should be done in the next few days.